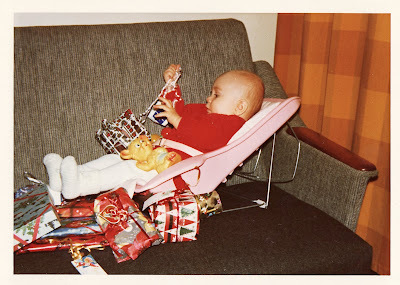 At the young age of 6 months the wrapping was obviously the most exciting aspect of Christmas. Later he has learned to appreciate the true meaning - that the Lord sent his Son into the world to save us. Long days at work and Christmas preparations have made little time for blogging lately. I promise to come back with new contributions after the holidays. I just want to thank everyone for visiting my blog! Thanks for your patience! Attorney General Martha Coakley is definately the front-runner in the race to win the special election in Massachusetts to fill the seat held for 47 years by Edward Moore Kennedy. Coakley easily secured the Democratic nomination yesterday by gaining 47 % of the votes. US Representative Michael E. Capuano came second with 28 percent, while City Year cofounder Alan Khazei and Boston Celtics co-owner Stephen G. Pagliluca got 13 and 12 percent of the votes respectively. Coakley will face the Republican State Senator Scott P. Brown in the special election that will take place on 19 January 2010. The Kennedy family has in a statement said that they are confident that Coakley will win the election. The family chose not to endorse any of the Democratic candidates before the primary election, but is now 100% behind the Coakley candidature. I follow a lot of blogs, and not only royalty-related ones. My third cousin Arthur Bjorn Egeli is a well-stablished painted residing in Pasadena, California. His blog Arthur Egeli Paintings is worth checking out, although I wish he updated it more often. He has a website as well, by the way. Arthur's first cousin Lisa from Maryland, who like Arthur is also my third cousin, doesn't have a blog, but she has a great website, and she is on Facebook and Twitter as well. For more on the Egeli artists, please go to my Ekeli page. Some times it is funny to just click on "Next blog" (at least Blogspot.com has that option) and see what happens. There are some talented artists and bloggers out there, like Drawman, Karen Thumm, Bill Guffey and Elephant Art. If you are into genealogy, you might want to check out Arnfrid Mæland's blog Fjellsiden (The Mountain Side), where you can among read about the Norwegian ancestry of Arlene Carol Dahl and Joni Mitchell. You need to understand some Norwegian though. But the Joni Mitchell article has a link to another Mithell article written in English. 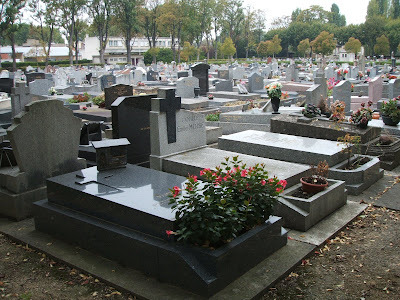 And if you have realized how much history and genealogy you can learn from visiting a cemetery, then maybe A Morbid Fascination is a blog to visit? 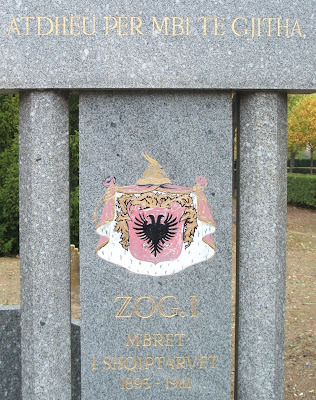 Grave of King Zog of the Albanians (1895-1961), proclaimed King 1928, in exile from 1939. According to Associated Press 9 October 2009, plans are under way to move the remains of King Zog to his homeland. 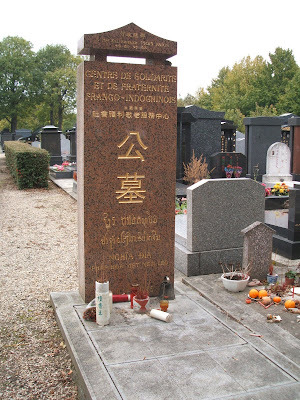 King Zog's elder sister Princess Adile (1890-1966) and her son Salih Doshishti (1913-1983) are also buried at Cimetière de Thiais. 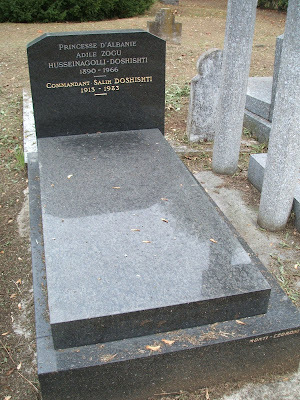 The back side of the Zogu grave. 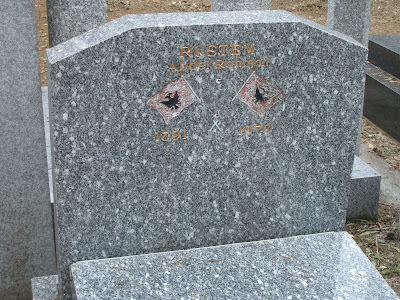 Grave of Abdel Rahman Rustem (1891-1970), a member of the royal court of Albania (?). 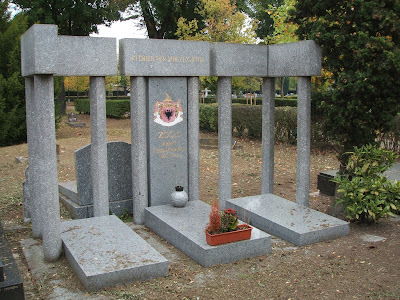 King Zog's grave seen from a distance. Hommage du Maire et du Conseil de Paris aux personnes ayant fait don de leur corps à la science Paris - 1982 (homage of the Mayor and Council of Paris to the people who have donated their bodies to science). 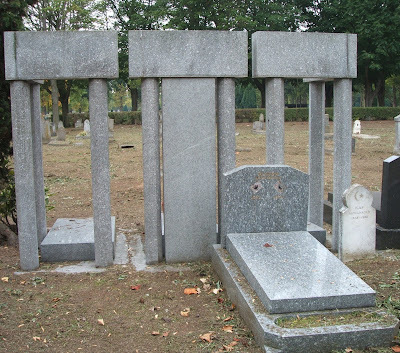 Memorials of people who have donated their bodies to science. 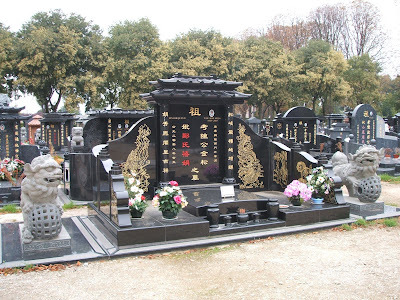 Different ethnic groups and different countries give different traditions of memorials. 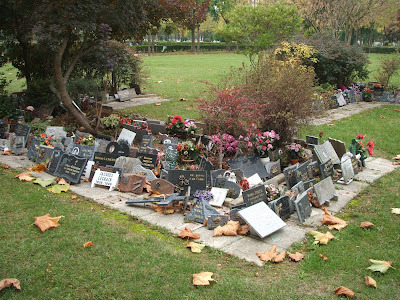 Le cimetière parisien de Thiais (Cimetière de Thiais) in Paris can be reached by taking the metro line no. 7 to Villejuif-Louis-Aragon (end of line 7) and then bus no. 185 or 285 (six stops). 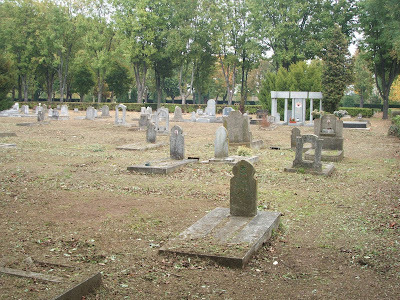 When you enter the cemetery you will find a big sign with a map of the various sections. 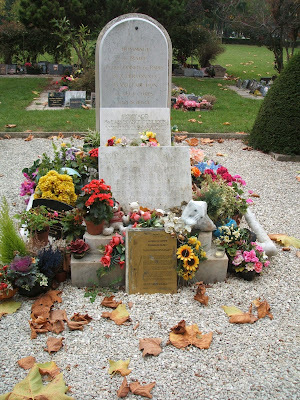 King Zog's grave is pointed out. See also the map (in pdf) at the official website. Updated on Monday 7 December 2009 at 21.40.